Published by B.C. 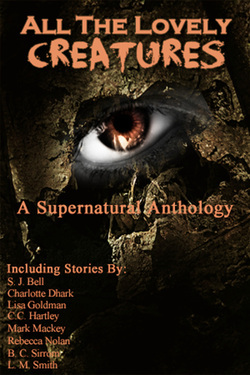 Sirrom and edited by authors from the Goodreads group, Paranormal and Horror Lovers, All the Lovely Creatures, which includes Lisa's short story, "The Wager", is a fantasy anthology of dark, terrifying, and sometimes misunderstood proportions. The eight stories are brought to you by the combined effort of S.J. Bell, Charlotte Dhark, Lisa Goldman, C.C. Hartley, Mark Markey, Rebecca Nolan, B.C. Sirrom, and L. M. Smith. Artwork by Emily Joyner and forward by Jennifer Rainey. Published October 11, 2012. In "The Wager", Treasa Bronson abruptly leaves her hometown on the anniversary of her husband and unborn daughter's deaths. Her travels take her to Seaside, where she drinks herself into inebriation and hears about the myth of Drac from a handsome fisherman. According to the myth, the sea serpent has lived at the bottom of the Rhone River and has tormented and killed the nearby villagers for five centuries. As weeks pass, she soon finds her life threatened with the realization that some myths are truer than she ever could have imagined. Author's note: The myth of Drac is based loosely on Drac, the sea serpent that ripped out the eyes of a lavender seller and killed droves of soldiers and villagers in Beaucaire, France. Today Drac is still considered a hideous, flesh-eating monster. For three days every June, the villagers celebrate Drac by forming a long, snaking procession, led by children carrying Chinese lanterns. All the Lovely Creatures is a FREE ebook on Smashwords, which can be purchased by clicking Here.